Customer loyalty is at an all-time low. Gone are the days when consumers stuck by their favourite brands come rain or shine. Now, customers are happily swapping and changing the brands they use and businesses they work with to get the quickest delivery. Never before has express delivery been more important for businesses. One survey showed half of consumers would abandon their shopping cart if the delivery options weren’t up to scratch. Trends now show that consumers expect same-day delivery as the preferred option during check-out and will shop around to get this option. Businesses are missing out on a huge sector of the market by not offering a rapid delivery option. If you remain unconvinced, below are seven reasons why your business should be offering same-day delivery and how it can help boost customer loyalty and satisfaction. It can be difficult to stand out in a saturated market, especially when almost all companies now offer free shipping, competitive pricing, and regular sales. However, offering same-day delivery will make you stand out from the crowd. In fact, recent statistics show that same-day deliveries can give a competitive edge of over 85% compared to those that don’t offer it. However, although customers are crying out for quick delivery, it’s still an emerging trend. And it’s not just the big online retailers that are catching on to this trend. More speciality industries such as the automotive sector are now realising that same-day delivery is an effective way to stand out from the competition. Whatever industry your business is in, updating your shipping methods will give you that competitive edge and show your customer base you are always striving to improve customer experience. Offering a same-day delivery service will make your business stand out as reliable and trustworthy. A pop-up business looking to make a quick profit isn’t going to invest in this kind of service, so it separates the industry leaders from the rest. Customers understand that it’s not always economical for companies to offer same-day delivery and it is yet to be the norm. However, if your company has the facility to offer this service, it will build a foundation of trust with your customers. They perceive your business as a reliable entity that is investing in its future. If you have a good product and can get ahead on this curve, your chances of customer retention are heightened. A survey conducted by Shopify found that businesses offering same-day delivery can attain a significant increase in year-over-year sales and twice the conversion rates. Offering same-day delivery has been shown to increase the productivity of staff members. Motivation is high when employees know orders must be fulfilled, sent out and delivered on the same day. The fast pace delivery process boosts staff productivity and increases motivation in the workplace. It also leads to increased sales and more revenue, meaning more capital to invest back into the workforce. Using a dedicated same-day delivery service helps you streamline your delivery process, meaning you may be able to cut costs elsewhere. Not only this but it reduces the risk of damage, spoilage, and missing shipments. A professional courier service has the resources in place to handle the entire process of rapid delivery. Rather than sending out each order one-by-one, you’ll have a set courier price for bulk shipping, helping you simplify the delivery process while saving money. By doing this you take some of the logistical work out of the job, freeing up the workforce and management to focus on quality and customer service. Although the shift to same-day delivery may seem like an increase in costs up front, the savings you’ll make in the long-run from increased efficiency and customer retention will more than make up for the investment. When customers have a critical need to get something delivered quickly, they will be prepared to pay a higher price for products. Customers are willing to pay more when companies can meet their demanding needs. By offering same-day delivery you can raise your margins (within reason of course) while keeping your customers happy. Statistics have shown that 88% of consumers are willing to pay for same-day delivery and 28% rate same-day delivery as the top feature they are looking for in their provider. This shows that the market is ready for same-day delivery and consumers are willing to use whichever company can offer them the speediest deal. When using a regular delivery service, losses and breakages are part of the process. However, when you use a dedicated same-day delivery courier, you get a higher level of service. Packages and fragile parcels are handled with care and because the customer is receiving their package the same day, the chances of losses are vastly reduced. Same-day delivery providers take pride in their work and as a partner of your business, they take pride in your product as well. Incorporating that dedicated level of delivery, not to mention good insurance and tracking, will reduce your losses and breakages and give you the peace of mind that each of your deliveries will arrive in pristine condition. It’s no surprise that millennials are now expecting same-day delivery. Born with the entire world constantly at their fingertips, they want convenience and are willing to pay for it. If you want to attract the loyalties of the younger generation, offering same-day delivery is the way to do it. In fact, 30% of millennials consider a company’s ability to offer same-day delivery before making a purchase. And with more and more businesses being successfully started by millennials, this isn’t a demographic that can be ignored. 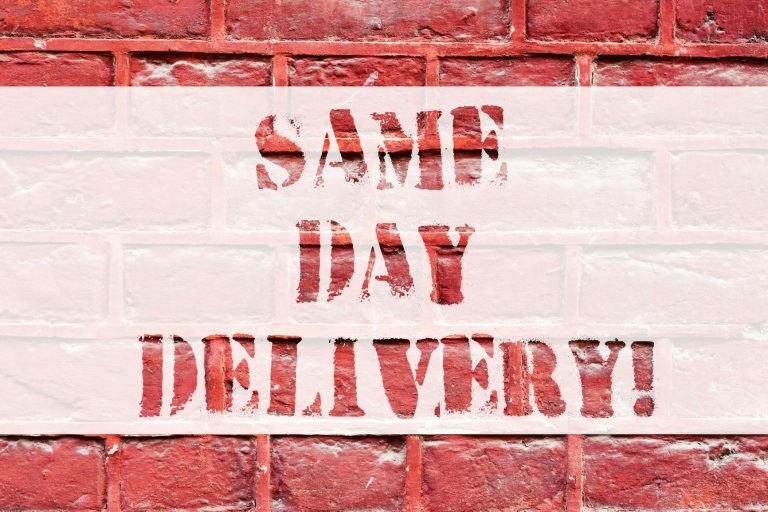 If we’ve piqued your interest and you’re wondering if same-day delivery can work for your business, get in touch with Same Day Dispatch Services today to get a quote. Tel: 0800 999 1010. We’ll talk you through the process and give you our expert advice on how our courier services can help your business. This entry was posted on Friday, August 10th, 2018 at 7:55 pm	and is filed under Sameday Couriers. You can follow any responses to this entry through the RSS 2.0 feed. You can leave a response, or trackback from your own site.